As a member of the RoboJackets robotics club at Georgia Tech, I was part of a four person team constructing an autonomous robot for the intelligent ground vehicle competition. 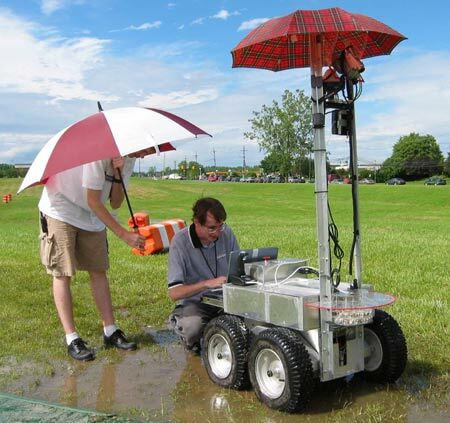 The robot had to navigate an outdoor course autonomously, while avoiding barriers and overcoming obstacles. The mechanical construction was simple but practical, allowing easy access to all the components. The sensors comprised of a sonar array in the front, and two machine vision cameras mounted above the robot. Using color separation, the software filtered white and orange from the image returned by the cameras. These colors represented the white lines defining the path, and the road barrels obstructing the path. Once these were identified, the software chose the appropriate path to follow. The robot performed well on the course, until it arrived at a ramp painted green to match the grass. However the ramp appeared white due to glare, and the robot moved off the course. Click to view .pdf report detailing the robot's design.